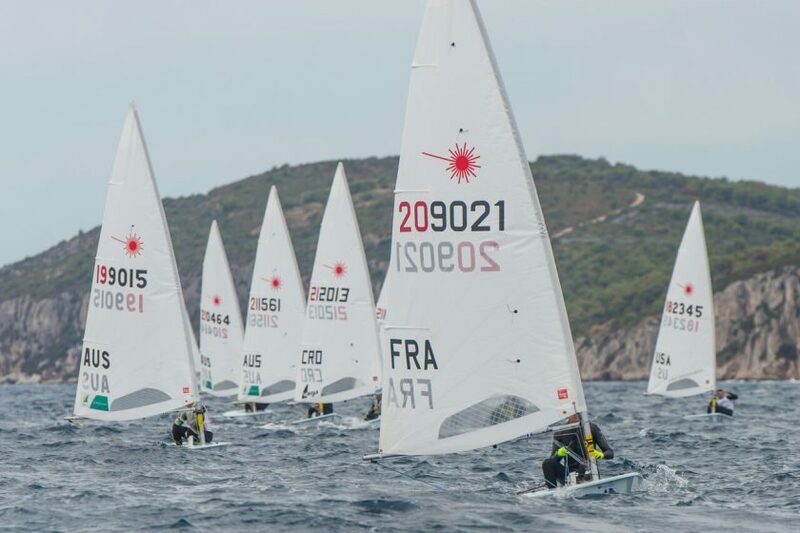 The weather changed again for the first day of Final Series racing in the Laser Standard Men’s World Championship in Split, Croatia. The start of racing was delayed to wait for an impressive electric storm with golf ball sized hail to pass over the city. The first attempt to start was on a new course area in a light, northwest offshore wind. Most of the fleet favored the seaward side of the course. At the committee boat, Mitchell Kennedy AUS had a clear run at the line and worked the middle-to-right side of the course to round first, ahead of Pavlos Kontides CYP and Jean-Baptiste Bernaz FRA. The fleet split on the downwind as the breeze went soft. Initially, the sea-side fleet seemed to have the advantage. About halfway down the leg, a slightly stronger pressure line came out from the shore side, resulting in an already tight fleet packing closer. After the first ten boats cleared the gate with Kennedy just in front of Bernaz, the remaining forty squeezed through the gate almost as one. Kennedy kept his cool up the next windward leg, while there were more changes behind. Kontides touched the windward mark trying to regain his position. The next run was also difficult as the breeze became softer. At the next gate, Tom Burton AUS had squeezed into the lead. But Burton gave it back to Kennedy after hitting the gate mark. Kennedy held his lead to the finish of a race in which several other well placed sailors had double-digit scores. The wind died after the gold fleet finished, leaving the silver and bronze fleet without a race. Two races are needed before a score from the Final Series can be dropped. Consequently, Bernaz leads overnight and Kontides drops to seventh with other similar changes in the overall positions.